ARLINGTON, Texas – Errol Spence Jr. wasn’t just too big and too strong Saturday night. He was too good, both offensively and defensively, and too smart for Mikey Garcia as well. The powerful southpaw spent most of their 12-round, 147-pound title fight intelligently picking apart the courageous Garcia to his head and body, and showing why he is one of the best boxers, pound-for-pound, in the sport. When it ended, all three judges confirmed the brutally obvious – that Spence had dominated an ambitious but out-gunned lightweight champion incapable of accomplishing any of the things he predicted. Connecticut’s Glenn Feldman (120-107), Florida’s Alex Levin (120-108) and Puerto Rico’s Nelson Vazquez (120-108) each scored their FOX Sports Pay-Per-View main event a shutout for Spence (25-0, 21 KOs). 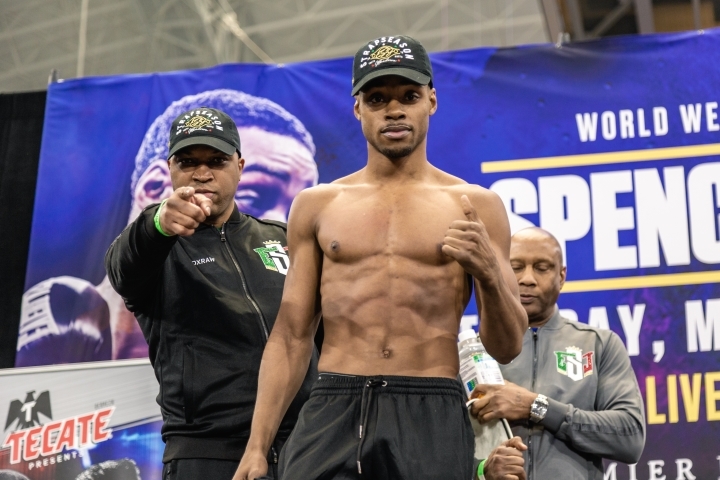 Spence successfully defended the IBF welterweight title for the third time in the headliner of a 17-bout card that drew a huge crowd of 47,525 to AT&T Stadium, the home of the Dallas Cowboys. The 5-feet-10 Spence, a DeSoto, Texas, native who went off as approximately a 4-1 favorite, picked apart the smaller, slower Garcia throughout what became an anticlimactic contest by the championship rounds. A bruised and battered Garcia displayed toughness by taking the hard-hitting Spence’s hardest shots, yet he never got into a rhythm and mostly was an easy target during the second half of a fight that devolved into what some skeptical fans anticipated it would become. “Throughout training camp, a lot of commentators thought he was too smart and I couldn’t box as well as him,” said Spence, who called out Manny Pacquiao after his impressive victory. “I showed I can box and I can move my head if I want to. Unofficial CompuBox statistics suggested the fight was every bit as lopsided as it appeared. CompuBox credited Spence for landing 345-of-1,082 overall punches, 270 more than Garcia (75-of-406). According to CompuBox, Spence connected on 183 more power punches (237-of-464 to 54-of-218) and 87 more jabs (108-of-618 to 21-of-188). The 31-year-old Garcia (39-1, 30 KOs), of Moreno Valley, California, lost for the first time in a 12-year professional career during which he has won world titles at 126, 130, 135 and 140 pounds. Garcia, a four-division champion, moved up two weight classes to oppose Spence. In his previous bout, Garcia beat Robert Easter Jr. by unanimous decision July 28 at Staples Center in Los Angeles to retain the WBC lightweight title and take the IBF 135-pound crown from Easter. Before Saturday night, the 29-year-old Spence had boxed less than one round in the previous 14 months. His first-round stoppage of mandatory challenger Carlos Ocampo on June 16 in nearby Frisco marked his only action after a seventh-round stoppage of Lamont Peterson in January 2018 at Barclays Center in Brooklyn. Spence showed no signs of rust, despite his comparative inactivity. Spence spent the 10th, 11th and 12th rounds brutalizing Garcia to the head and body. Garcia could do little in those rounds other than absorb one punishing punch after another. Garcia was taking so much punishment, his older brother/trainer, Robert Garcia, wanted to stop the bout. Spence viciously assaulted Garcia throughout the ninth round. Though game, Garcia couldn’t keep a relentless Spence off him during those three minutes. Spence pushed Garcia backward by landing straight left hands to his head and brutal body punches. A combination by Spence knocked Garcia off balance about a minute into the eighth round. Garcia tried to get back in the fight later in that round, but Spence was too active and accurate for Garcia to get into any kind of rhythm. Spence connected with a straight left to Garcia’s body early in the seventh round. With just over a minute to go in the seventh, Schorle warned Spence for hitting Garcia low. An aggressive Spence peppered ripped Garcia to the body and drilled him with a straight left up top early in the sixth round. Garcia fired back enough shots to keep Spence from hurting him more later in the sixth, but Spence clearly was building a sizeable lead by then. Spence missed wildly with a left hand about 1:10 into the fifth round, but Garcia couldn’t counter when Spence exposed himself. Spence spent much of the remainder of that round attacking Garcia’s head and body. Spence opened up on Garcia at the start of the fourth round, when he landed left hooks and a straight right that got Garcia’s attention. Spence pressed forward with his jab later in the fourth. The champion cracked Garcia with an overhand left that knocked him backward later in the fourth. Garcia managed to land a few flush punches toward the end of what was largely a lopsided fourth round. Spence’s straight left hand caught Garcia about 1:10 into the third round. A straight right hand by Garcia connected with around 1:15 to go in the third. Spence blasted Garcia with a left to the body later in the third. He added a straight left up top just before the bell ended to conclude the third round. A straight left hand by Spence about 45 seconds into the second round stung Garcia. The challenger tried timing Spence with his left hook and finally snuck one in around the one-minute mark of the second round. Garcia also attacked Spence’s body late in the second round. Spence pressed forward and landed successive jabs before the second round ended. There wasn’t much action in the first round, other than Spence landing a straight left after the midway point of it. Garcia and Spence spent much of those first three minutes attempting to feel one another out while flicking jabs that didn’t land. That opening round wasn’t at all indicative of what was to come.